Fit-again Tyrone defender Conor Clarke is a surprise inclusion on the bench for Omagh St Enda's Ulster club final against Slaughtneil on Sunday. Clarke has made a rapid recovery from a cruciate knee injury sustained only six months ago and could come on as a substitute in the Athletic Grounds. 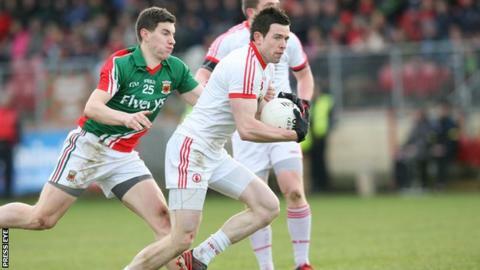 He missed Tyrone's Ulster championship campaign after being injured in May. Meanwhile Slaughtneil are happy Chrissy McKaigue is showing "no ill effects" from his seven-day trip to Australia. The defender played in Ireland's International Rules test in Perth on Saturday and will play against Omagh in his club's decider in Armagh. "We held training back for a night to allow him more time to recover," said assistant manager John Joe Kearney. "He is a great athlete and the journey does not seem to have affected him." McKaigue played in the club's Ulster semi-final win over Clontibret before jetting out to join Paul Earley's Irish squad for the International Rules test, which Ireland lost 56-46. The 25-year-old, who is central to Slaughtneil's bid to a win a first Ulster title against fellow first-time finalists, Omagh St Enda's, returned home on Monday. The possible appearance of Clarke is a big addition to Omagh St Enda's, who recently won the Tyrone SFC title for the first time since 1988. "It's an incredible recovery and it's a credit to himself that he has managed to get himself in a position to play," said a member of Omagh's backroom team. "It takes most lads nine or ten months. "He has been training for the last two weeks and is keen to be involved and play some part in the game." John Joe Kearney confirmed that Slaughtneil's highly rated fullback Brendan Rogers is in contention to start Sunday's final, just three weeks after suffering a hamstring injury while playing for the club Under-21s. "He played a full match in training (on Wednesday) but the jury is still out on whether he will start. "We are thinking about it because he's had a great year and it has freed Chrissy to come out to centre half back." Slaughtneil's hugely experienced manager Mickey Moran, who was in charge of Derry, Donegal, Sligo, Mayo and Leitrim, managed Omagh when they won the last Tyrone SFC title in 1988. "Mickey knows some of the Omagh back-room staff and knows some of the Omagh players as well, and I'm sure they will shake his hand at the end no matter what the result is," said Kearney. "The fact he used to manage Omagh won't make a difference on the day. Once the ball is thrown in, you want the team you are with to win."